Heather Ross' beautiful prints are part of what got me into quilting. Many, many years ago, my local yarn shop brought in a few of her fabrics just to see whether they would sell. 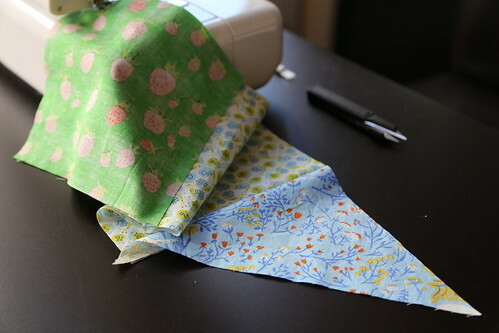 My tuition-paying student brain couldn't quite justify buying more than a half yard of two different prints when I didn't even own a sewing machine. Those two prints got me thinking about sewing and about how much I liked to sew when I was a kid. The more I thought about it, the more I realized that although I loved to knit, I really wanted to be able to sew. When my 25th birthday rolled around, I asked for a sewing machine. 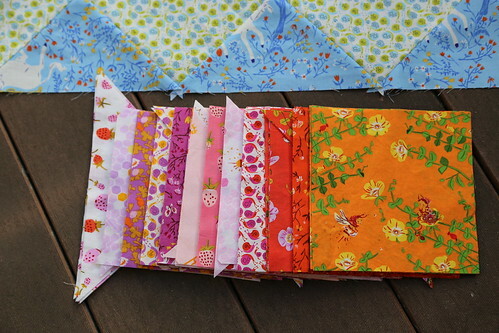 Shortly after that, I bought fabric for the very first quilt I ever finished. 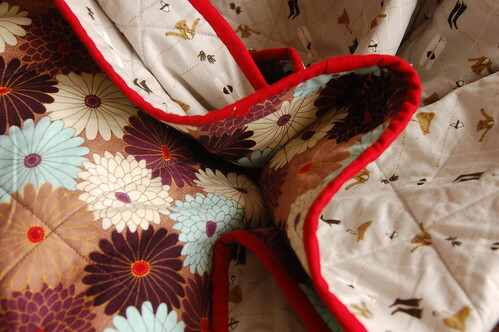 It was a whole cloth baby quilt that I made using two prints I bought at the workroom not long after it opened. One of them was a print from Heather's West Hill collection. The second quilt I started with my brand new machine was based entirely around the pink mermaid print in Heather's Mendocino collection. 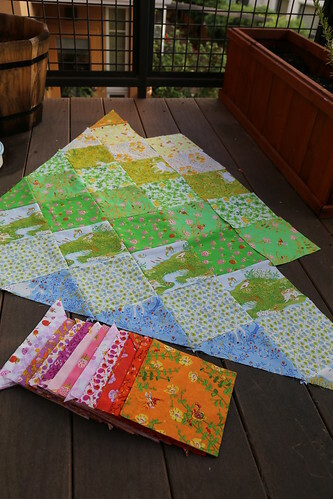 When I finally connected the dots and realized that all of these great prints were by the same woman, she had stopped releasing quilting cottons and I was again perplexed at how to incorporate her work into my sewing. You can imagine how excited I was to hear of her Briar Rose collection and of the recent reprint of her Far Far Away 2 collection. With a few more years of quilting experience under my belt, I stocked up on prints from both collections with a half yard bundle of each and decided to combine them into my perfect quilt. A rainbow tribute to Heather's amazing work (super lame but I'm sentimental like that) using Rae's Rainbow Quilt pattern as my jumping off point. 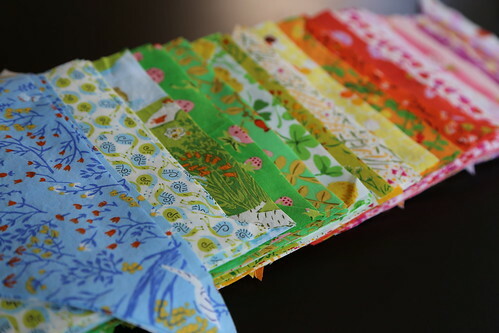 Last week, I finished cutting up all of my fabrics and arranged them in colour order. I started piecing them all together last weekend and I can say that I am already head-over-heels in love with this quilt. The simple construction really lets the amazing hand-drawn quality of these prints shine. These collections were made for each other. There is still lots to go on this quilt but it is coming together so quickly since I just can't get enough of this one. If you're looking for me this weekend, I'll be sitting at my machine. Good for you - a sewing weekend! LOVE, LOVE, LOVE HR's collections. I made a couple of baby quilts for my grandsons using her goldfish in a bag. 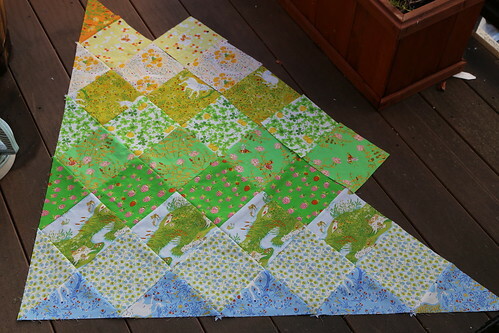 Your first quilt looks great - would love to see more. And the one in "colour order" is so very pretty! This is looking fantastic Amanda! Love these two lines together!